Join Penn Nursing in celebrating the 120th birthday of the School’s first Dean of Nursing, Theresa I. Lynch, HUP’20. Remarks by Dr. Patricia D’Antonio, Director of Penn’s Barbara Bates Center for the Study of the History of Nursing. Join the Arts at Homecoming Host Committee to celebrate the launch of the Weekend and to recognize the 10th anniversary of Platt Student Performing Arts House. 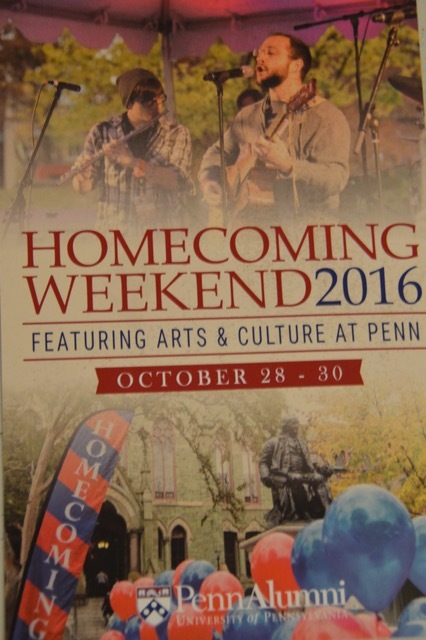 Come and have a cocktail, hear remarks about the state of arts and culture at Penn by Deputy Provost Anita Allen, and enjoy student performances. Platt Student Performing Arts House provides leadership and support for the creation and implementation of arts programming for students at the University of Pennsylvania. We advise and train students pursuing their extra-curricular passions for the performing arts and those preparing for a career in the arts. Alumni and students, current and past program faculty are invited to reconnect, network and learn about today’s program, with wine and hors d’ouevres. Join Dean Villarruel, and program directors Wendy Grube and Bill McCool, as the Women’s Health program celebrates 30 years and Midwifery celebrates its 35th anniversary. Kick-off Homecoming Weekend at the 82nd Annual Alumni Award of Merit Gala. Join Chairman David L. Cohen, L'81, President Amy Gutmann and Penn Alum.ni President, Julie Platt, C'79 for an evening of food fun and celebration as we honor alumni who have demonstrated outstanding service to Penn! Association of Latino Alumni and Center for Hispanic Excellence: La Casa Latina invite you to join us at our Homecoming Latinx Alumni Mixer. This is a great opportunity to reconnect with old friends and make new ones! Light hors d'oeuvres and two drink tickets will be provided. Join William Whitaker, Curator and Collections Manager of the Architectural Archives, for a walking tour of the architectural masterworks on Penn’s Campus. Trained as an architect and architectural historian, Whitikar primarily works on documenting and interpreting Penn’s design collections. Pre-registration is required and space is limited to 35. Enjoy drinks and light fare with the largest Sphinx in the Western Hemisphere and hear the story of Penn’s Sphinx’s journey from Egypt to Philadelphia! Space is limited. Advanced registration required. Cost is $20. Attend an open house at the Weingarten Center highlighting PennFaces: The Resilience Project, a collaborative initiative developed by students, the Weingarten Center, and University partners that shares stories and generates dialogue around obstacles, success, and experiences of learning and growth.